President Larry Goodwin announces his retirement at an April 22 press conference. 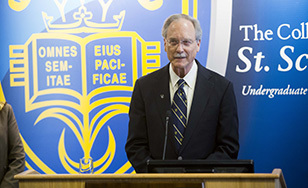 Larry Goodwin has announced that he will retire as president of St. Scholastica effective June 30, 2016. At a campus press conference on Wednesday, April 22, Goodwin said the timing is right. "In June of '16 I will turn 70 years old and I will have been president for 18 years. It will be time for new ideas and energy. "Working at this special College has been the greatest calling of my life, and I will miss it dearly. But meanwhile, there's work to be done, and so I will happily be with our St. Scholastica community on this journey for another year." Goodwin's successor will be chosen by the College's Board of Trustees. A national search will be led by a committee headed by Trustees with representation from faculty, students, staff, and the Sisters of St. Scholastica Monastery. The committee will be assisted by a national consulting firm. At the end of June 2016 Goodwin will be the longest-serving president in what will then be the 104-year history of the College. He earned a Ph.D. in theology from the University of Chicago. He joined St. Scholastica in 1987, serving as dean of faculty and vice president of academic affairs before being named interim president in early March 1998. After a nationwide search he was inaugurated as the private college's 11th president in October 1999. Mary Ives, chair of the Board of Trustees, said Goodwin has "greatly strengthened our beloved St. Scholastica academically and fiscally. "More people are benefiting from the St. Scholastica experience today than at any time in our history, at campuses throughout Minnesota as well as in Arizona and around the world in our online community. The Duluth campus is home to new programs, and to new buildings where learning and living reinforce each other. "As we look forward to the next chapter of the College's story, we do so from a position of confidence. We will continue to be beneficiaries of Dr. Goodwin's vision of excellence in the Catholic Benedictine tradition." During Goodwin's presidency, enrollment has more than doubled, from 2,040 in 1998 to 4,235 at present, with major strategic growth in graduate, online and nontraditional adult student markets. The number of academic programs has risen from 49 in 1998 to 64 currently. Study-abroad programs rose from three in 1998 to 10 at present. Goodwin has strengthened St. Scholastica's Catholic Benedictine identity while emphasizing openness to students and faculty of all faiths. He oversaw creation of the Braegelman Program in Catholic Studies and the Oreck-Alpern Interreligious Forum, as well as creation of the Dignitas first-year program, which introduces students to Benedictine values, the Catholic intellectual tradition, and Catholic social teaching. Goodwin has worked to increase diversity on campus. The proportion of students and employees who are people of color has increased, and he created a cabinet-level Chief Diversity Officer position in 2013. In 2012 the College's Multicultural Leadership Student Orientation won the Touchstone Award from the Duluth-Superior Area Community Foundation. St. Scholastica's budget has more than doubled, from $34 million in 1998 to $73 million today. The College's endowment has risen from $15 million in 1998 to $70 million today. Currently Goodwin is leading the Campaign for the Second Century. Now in its first year, the seven-year effort's initial working goal is to raise $50 million for scholarships and endowment, a graduate health sciences campus, and upgrading iconic campus buildings. He opened new sites for nontraditional learners in St. Paul, St. Cloud and Rochester, MN, and in 2014 began the process of establishing health-related programs in the Phoenix, AZ area. On the Duluth campus he oversaw construction of Burns Wellness Commons, the Cedar, Kerst and Scanlon residence halls and the expansion of the Science Center. He partnered in development of Mars Lakeview Arena with the Marshall School. Goodwin has promoted strategic enrollment goals through athletics, adding programs such as football and women's hockey. The number of varsity programs rose from 12 in 1998 to 22 currently. Among off-campus activities, Goodwin is a past board member and chair of the Twin Ports United Way, and is a past board member of the National Association of Independent Colleges and Universities and the Council of Independent Colleges. He is chair of the Association of Benedictine Colleges and Universities and past chair of the Minnesota Private College Council (MPCC). "Larry Goodwin is one of the most outstanding leaders I have known in private higher education at the state and national level," said Paul Cerkvenik, president of the MPCC, which advocates on behalf of 17 nonprofit private colleges in Minnesota. "He has made The College of St. Scholastica a remarkably entrepreneurial institution during his tenure. And, because of his passionate commitment to the values of a Catholic, Benedictine liberal arts education, St. Scholastica produces graduates who have not only the knowledge needed to succeed in a career, but more importantly, the capacity to live their lives meaningfully and well. His service to St. Scholastica has benefitted not only the College, but all of Minnesota."